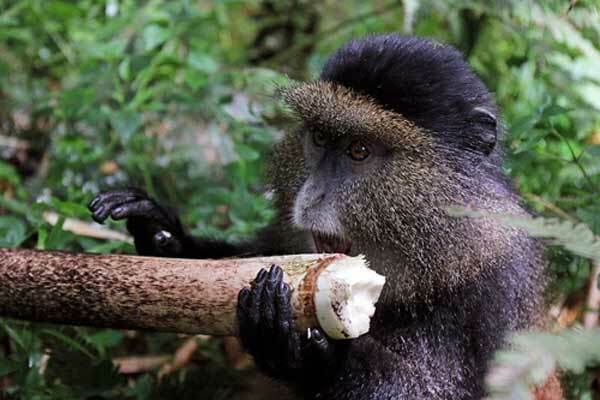 The 3 days Rwanda Gorilla trekking and Golden Monkey trekking safari takes you to Rwanda, the "LAND OF A THOUSAND HILLS". 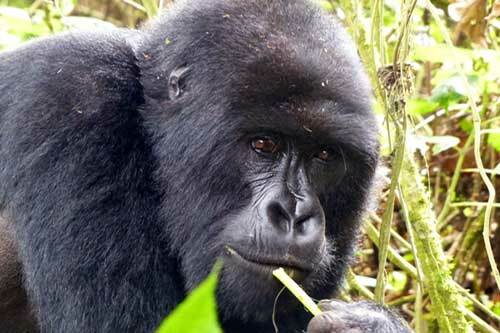 This beautiful East-African country is one of the 3 countries where you can do mountain gorilla and Golden monkoey tracking, the others being Uganda and DR Congo. This gorilla trekking tour takes place in Volcanoes National Park(Parc Nationale des Volcanoes), the center of Primate tracking in Rwanda. Apart from the Gorilla safari, you will also have a chance to do Golden monkey tracking. IUCN(International Union for Conservation of Nature). This beautiful gold and silver-clad little monkey is always found in the bamboo section of the forest feeding. 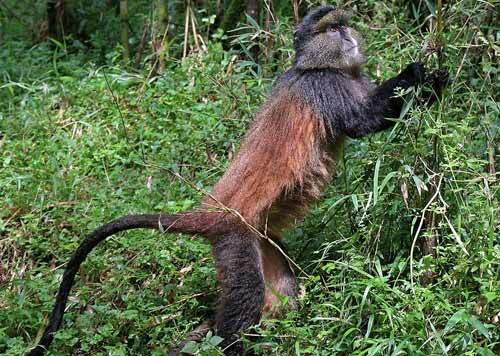 Golden monkey trekking is a new safari and few people have seen these animals in their natural habitat. Welcome to Rwanda the "LAND OF A THOUSAND HILLS"
At Kigali international airport you will be received by our company representative and your safari guide to be. The guide is Avery knowledgeable person please ask him anything you want to know about Country, and he will recommend the best depending on your interest, such as changing money, good place for Lunch, etc. 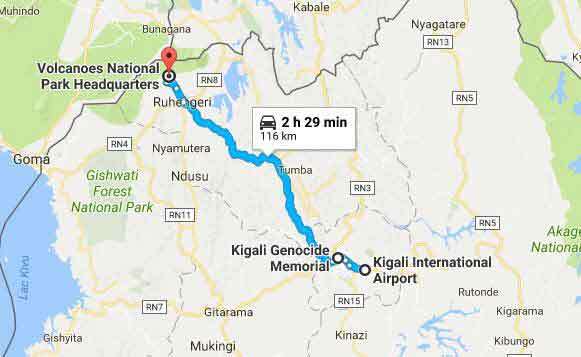 The guide will take you for a city tour and also you can visit the Kigali Genocide Museum before setting off for Volcanoes National Park. Upon arrival, we check in the Lodge and then rest for the trek on the 2nd day. Today you start the day early in the morning with breakfast and packed snacks. We drive to the park headquarters for briefing and knowing the group/ gorilla family you will be visiting. The park authorities arrange the days visitors into groups before being led by the ranger guide in the forest for a life time Gorilla trekking in the forest. The duration of trekking is not certain due to a lot of determinant factors which may include the gorilla movements as they search for food. But surety is you will find them and it will bring rest in your heart however hard it might have been locating them. You will then spend a quality hour with them before coming back to the lodge with an option of visiting the cultural village in the evening. After breakfast, you will drive to the park offices again this time for Golden Monkey tracking. 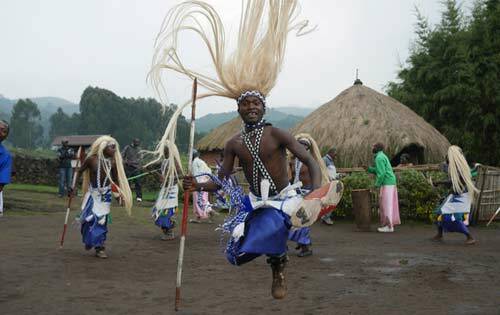 As your guide does the registration you enjoy the Rwandan traditional dance. Then you will be led by a ranger guide for tracking and spend an hour with these endangered primates. After golden monkey trekking, you will transfer to Kigali for your flight back home.